A recent plein air paint-out was at the E. Waldo Ward Ranch in Sierra Madre. The property started off as an orange grove in 1891. Mr. Ward's plan was to produce marmalade which he perfected in 1918. In 1902 he built a large home and barn which are still in use. Behind the home is a small canning factory which makes marmalades as well as many other preserves and jellies. It had rained the night before the group planned to paint at the Ward Ranch and I was sure no one would be there to paint. The morning looked rainy but then the sun came out slightly. Maybe a few painters would be there after all! I was going to arrive at the location so late that I decided to take my gouache (which dries faster than transparent watercolor) and paint a small 5"x7" piece. We had a turnout of about 10 people and had a lot of fun. It's a pretty location. We shopped in the store, each coming out with jars of goodies. The afternoon rain held off until we were finished with our casual discussion of the paintings. 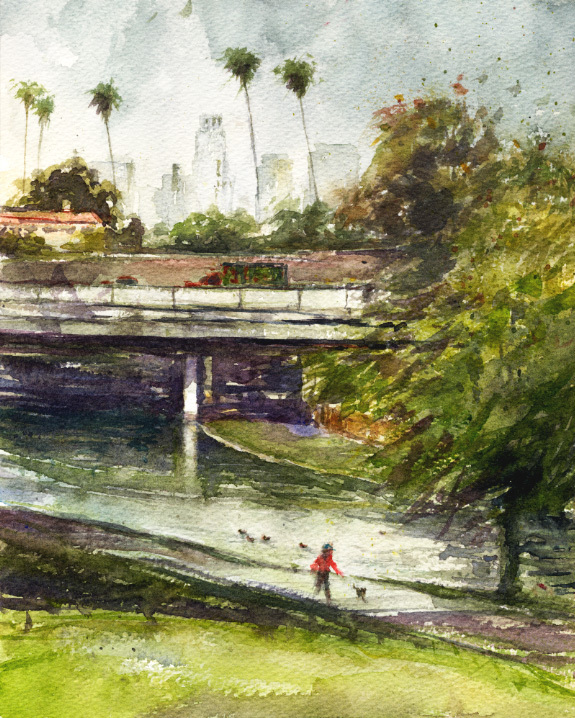 The Pasadena Water and Power plant was our plein air painting location on a recent Saturday. Reading the century-long history of Pasadena's water and power is interesting but turbines and generators just aren't my area and I wish I knew what all is going on there. It's definitely an exciting and terrific-looking industrial location to an artist's eye. 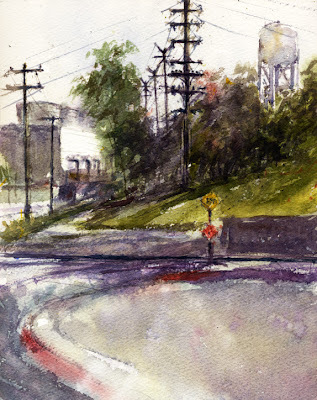 I was really looking forward to the morning of painting there, and the dreary day cleared up a little to add some shadows. It's quite a large property with many wonderful structures and views to paint, including a beautiful 1938 street corner fountain. Conveniently there is a short cul-de-sac offering perfect places to sit and paint the variety of buildings and smoke stacks. I'm sure the security cameras were watching every brush stroke. The power station building in the view I chose had some steam coming out so that was exciting, but I ended up not adding that since my sky dried lighter than I'd hoped. I also wanted to include the water tower. The photo below of the tall structures with the pipes, tanks, and ladders was just to the left of my view. In the light, it had some neat pastel colors and shadows but I didn't think I could do justice to all that was happening in those buildings. The Gold Line light rail goes past where we were painting so I had to take a photo, below. I'm also adding a shot of the deco-style tiled fountain. When we visited Disney's California Adventure park at Disneyland about a week later, we noticed that the new fountain at the new Carthay Circle looks like a sister to the Pasadena fountain and I've added its photo. There are several "vintage" elements at the new park that seem to have originated in the Pasadena area. My blog's first Christmas! Last December I would never have thought I'd be posting on my own blog so this is pretty exciting! I have to share that in 1995 I planned to paint a watercolor of some vintage Christmas ornaments in their box with the tissue around them. I took some snapshots at the local flea market for reference and inspiration. 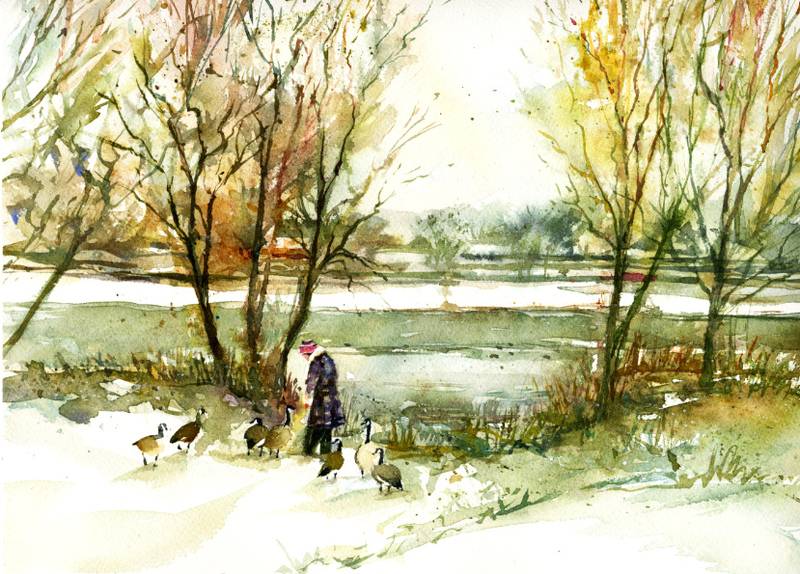 The painting never happened but I have hundreds of wonderful Christmas snapshots which I enjoy adding to each year. Of course I branched out from snapping just ornaments in boxes. There are some funky flea market Christmas items out there. Over the years it's been interesting to see the changes in what is available at the flea market and in stores. The photos are still inspiring so maybe I'll actually do that painting sometime. So here are a few photos from a couple years ago to help in wishing you all the best Christmas and 2013. 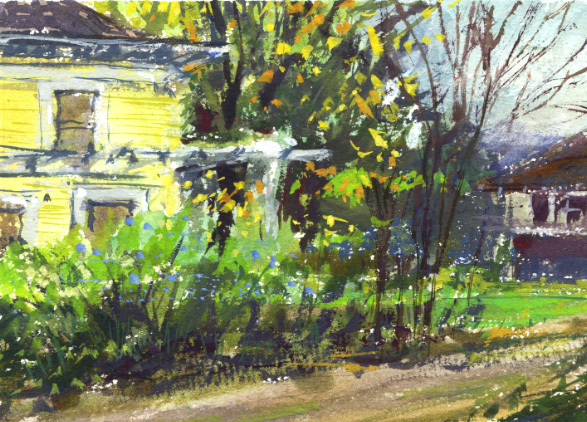 Last Saturday we painted at Barbara Field's home. She organizes the plein air group and also writes a wonderful blog at http://whatisee-baf.blogspot.com. Barbara generously invited us to paint at her house. It was definitely a special holiday get-together. 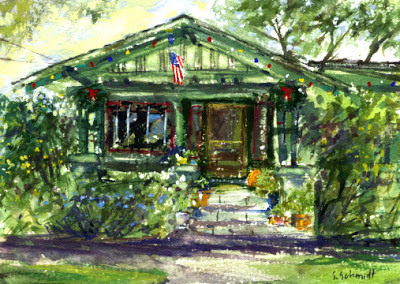 Barbara's house is a charming craftsman style bungalow. I love the pleasing details in craftsman homes, a really cozy and beautiful style. The backyard at Barbara's was also special since it had a Monarch butterfly habitat. Wow! The butterflies like milkweed plants and Barbara has many. It was fascinating to see many Monarch caterpillars, cocoons, and also milkweed bugs in all sizes. Barbara gave me some milkweed seeds to plant and hopefully attract some butterflies. The front of the house was decorated with some Christmas wreaths and lights. It looked so festive that I had to try painting it. This is a 5" x 7" gouache since I didn't think I would have much time for painting after such a terrific morning visit at Barbara's. December 21, the first day of winter, the winter solstice. It's cold, even here in Southern California. Since I posted some autumn watercolors for the first day of fall, I wanted to post a favorite winter piece for the winter solstice. Last December, on the Paint My Photo website the challenge for the month was a relaxing end of the year "non-challenge". The assignment was to just choose a photo from the thousands on the website and paint something seasonal that could possibly be used for a holiday card if the artist wanted to. In Southern California we have our seasons but usually no snow in the Los Angeles area in December so I was inspired to try painting some snow. 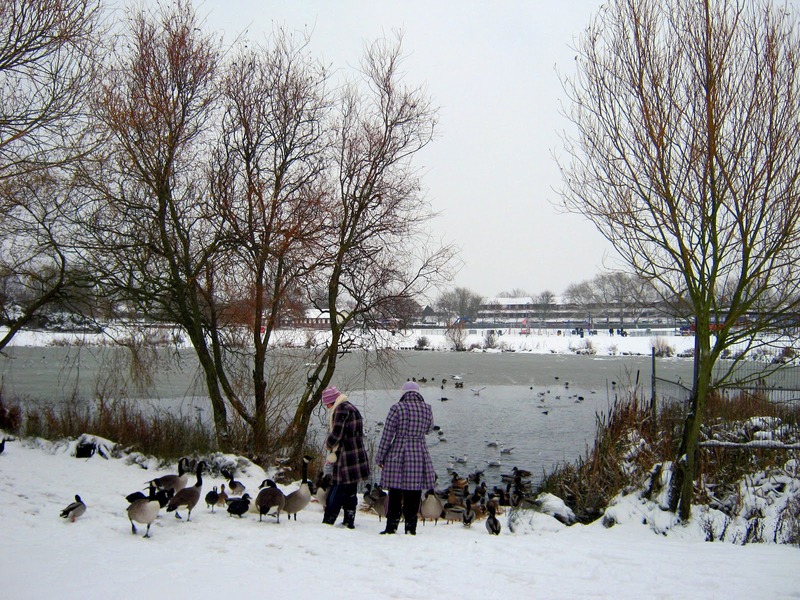 I looked at many terrific photos on the website of wintery scenes and finally decided on a beautiful shot of two women in the snow feeding ducks and Canada Geese beside a lake. I painted this before any of the plein air pieces I've been painting recently so to me it has a different look and mood. The photo is by Roy Simmons and is gorgeous. 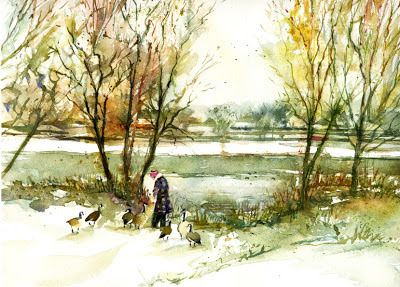 I have found a group of artists who go out plein air painting on Fridays! Another wonderful group of new friends and another day to paint. Maybe I'll improve with all this painting. 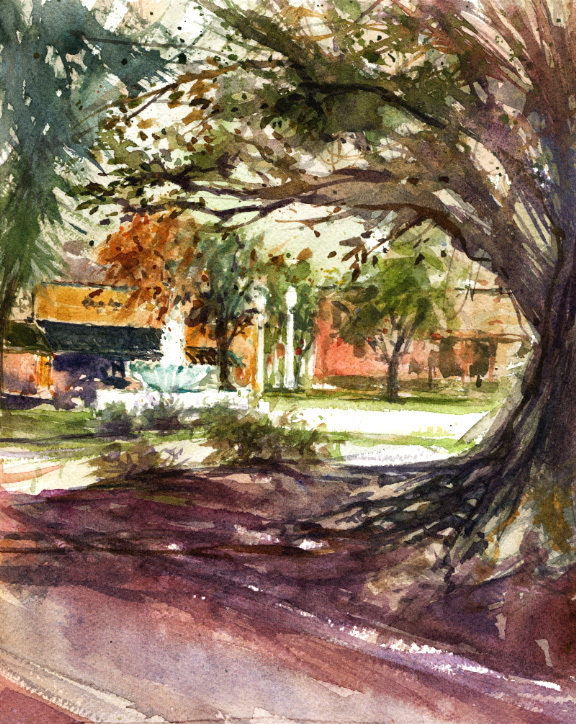 We met at Descanso Gardens where I painted once before with the Thursday group and blogged about in my post titled "Descanso Gardens". 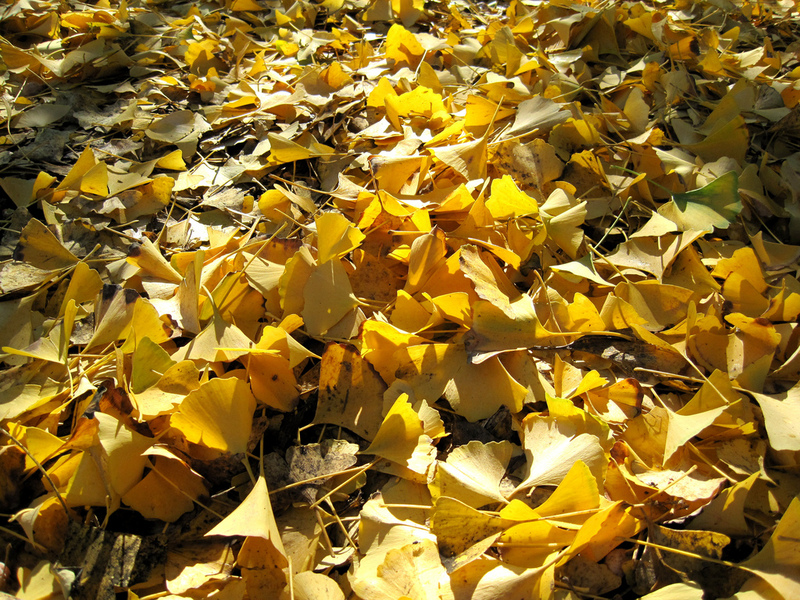 Someone said the Ginkgo trees' leaves were changing and were really beautiful. So true! The trees were near the entrance and their leaves were a shockingly bright yellow. They were the main attraction that day and people were taking photos, and some women were gathering the fallen ginkgo nuts. They are used in Chinese cooking. The trees are the national tree of China and the official tree of Tokyo. Of course they have those gorgeous and distinctive fan shaped leaves. I chose a view from a little distance away. Trying to convey the brightness of the ginkgo leaves is a challenge in watercolor so I tried to have some other points of interest in my piece. Wow, another park to paint in! I'm seeing so many new parks since I joined the plein air groups. 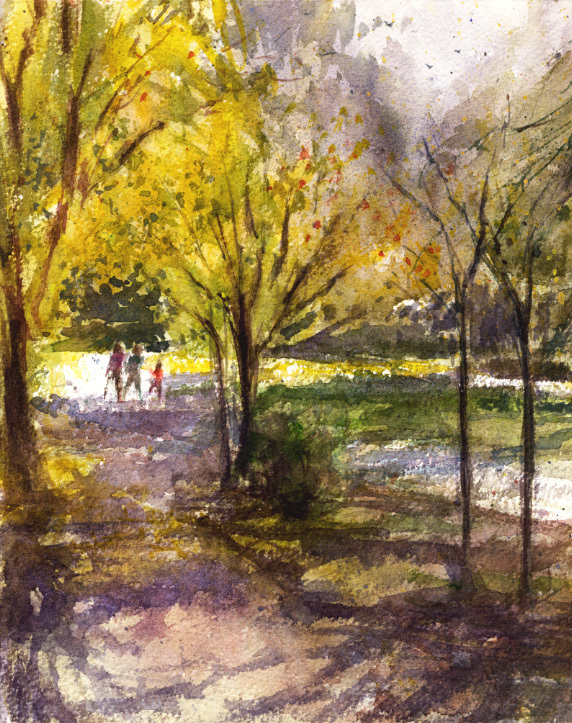 There are usually a lot of choices of painting subjects within the parks and also in the surrounding areas. Last Thursday the group met at Library Park in Monrovia. It's a lovely park at the public library. The stand-out feature is the Moreton Bay Fig trees. These are huge trees, and beautiful as well. They are from the eastern coast of Australia and can get to be 200 feet high, 8 feet across. If Monrovia's trees aren't quite that large yet, they are well on their way. The special trees are in many parks and large gardens in California. The weather was cold and damp as I walked around deciding what to paint. I felt I had to go with a view including one of the spectacular trees. This is 8"x10". Monrovia's downtown is very charming and even more so with the Christmas decorations. I took some photos for a possible painting. The sun finally came out at noon and we had a big group for the after-painting discussion. The Saturday plein air group recently met for painting at Hollenbeck Park in the Boyle Heights neighborhood of East Los Angeles. Rain was predicted but luckily it didn't start to sprinkle until we had finished painting. The park has been there since 1892. It's hilly and has a beautiful long lake. Some old park features like bridges and a boat house are gone now. There is only a small part of the old boat house remaining. Unfortunately, in the 1950's a freeway was built through the lake. But the lake still survives, home to lots of ducks and geese. Since the park is hilly, there are some nice views of downtown Los Angeles. I couldn't resist choosing a downtown view to paint with the distant buildings and changing sky. The boat house remnant is picturesque as well. Maybe next time! After we painted we went to at a nearby, very popular cafe, El Tepeyac. They've been famous for their Hollenbeck Burritos since 1955. What a fun day! But it was watercolor homework so it was challenging while being fun to try as well! Vinita Pappas has started a new online watercolor class. Besides watercolor instruction she is also including other topics in her posts so it will be exciting. One of the monthly topics is art marketing which I haven't yet tried and need to find out about. This blog is a start in that direction. Vinita posts a monthly challenge, and also a demo video which we can attempt to follow as well. 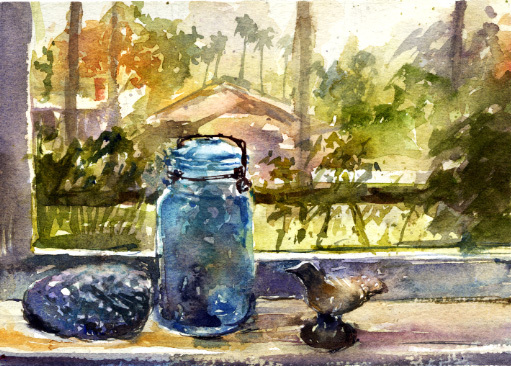 The November painting challenge was titled "Through the Window". Our piece could be literal or interpretive, hopefully revealing a little of the artist's personality. I wanted to do a painting that showed some inside elements as well as an outside view. Below is my piece, looking out one of our windows and across the street. 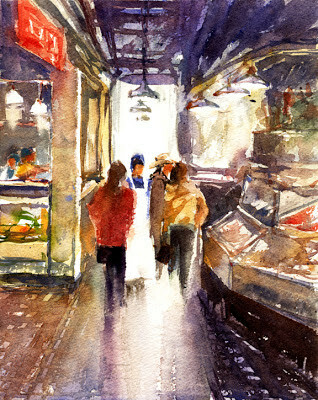 Vinita's demo video was of her painting of the famous Pike Place Market in Seattle, WA. I really had fun with this challenging piece. The photo reference was of some backlit figures, fish cases and counters, signs, and lighting. A complicated scene so I was nervous to try it since I hadn't painted any interior views like this before. It went well and I like the result below. I hope I can visit this market someday. The Virtual Paintout - New Brunswick! 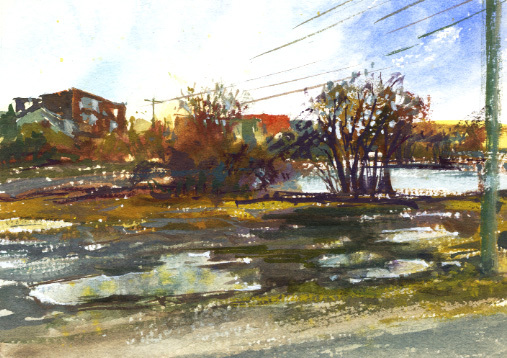 With a holiday and weather that's been a little rainy for plein air painting, it's nice to have the Virtual Paintout for doing a few watercolors. For November 2012 the location was New Brunswick, Canada. Bill Guffey created the Virtual Paintout and hosts it on his blog and Facebook. Participating artists use Google Street View to "walk" around Bill's assigned city or country to find their view to paint. A virtual version of a real paintout. We submit the URL of our view along with our paintings which Bill posts on his blog. It's always fun to see what the artists have chosen to paint or draw. I didn't spend as long as I usually do looking around New Brunswick on Google. I wasn't finding much that was exciting to paint. I'm sure I just hadn't found the right locations yet! A watercolor I saw recently had some puddles of water which were really beautiful so when I happened upon a view with puddles I chose it to try. Next weekend the plein air group is painting at a power plant. 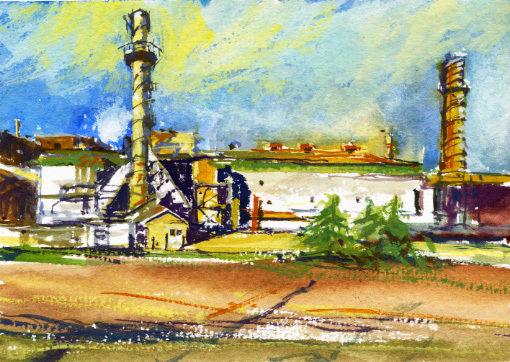 When I found some sort of factory with smoke stacks I wanted to practice a little for the real life plein air paintout coming up, weather permitting. I like to try using gouache for these pieces. Still practicing with it and I'm enjoying its opaque qualities. These paintings are 5"x7".